After being on a schedule for more than a week, we had welcomed a free day to do whatever we wanted in a leisurely way. The good thing about being on a schedule is that we got things done. The bad thing is that once we get off the schedule we became so lax about time, we almost got nothing done. Today was no different. We slept late, hung around the apartment until near lunchtime then we spent more time than we should have in the African store. Only our stomachs forced us to leave – and caused us to change plans: now it was lunch at Mama Africa, then shopping at Green Market Square after. Seeing the sign to Mama Africa made us feel like we had discovered an oasis in the desert. We quickened our steps and arrived to its door before we realized it wasn’t open. We could taste our disappointment. 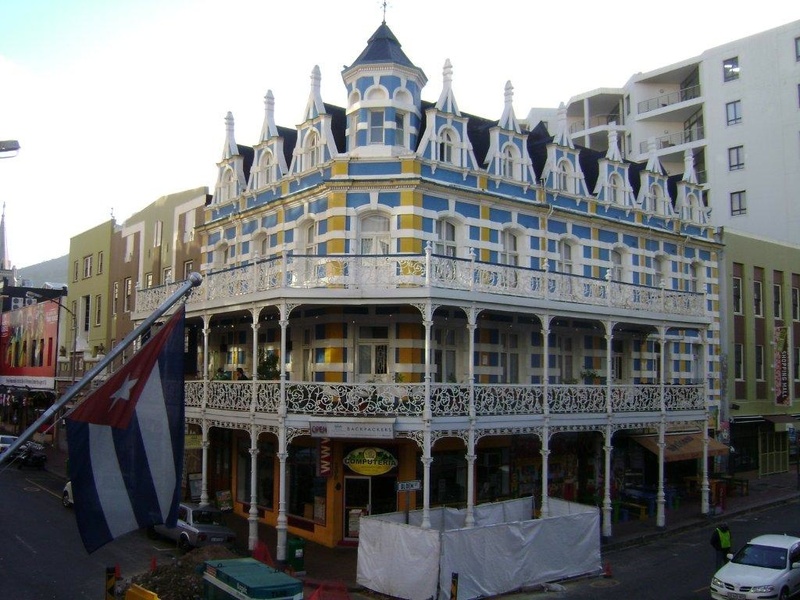 Luckily, Cape to Cuba, another restaurant was opened so we went there instead. Cape to Cuba felt tropical and inviting. 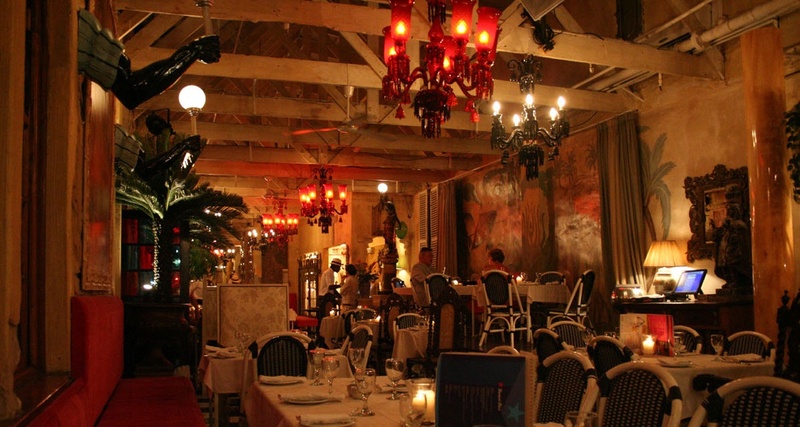 Located on the second floor of a three storey building, it opens out to a small balcony with a few tables and chairs. The décor is an interesting mix of Spanish Gothic, beautiful tiles, glass chandeliers, palm trees, murals, the Cuban flag and photos of American celebrities in 1950’s Havana. The wait staff wore Che Guevara’s signature beret and shirts with the Havana Club (Cuban rum) logo. Seeing such an open celebration of Cuba outside of Cuba was surprising until I remembered that the embargo in place against that nation is a U.S.-only construct. They had probably just opened as, except for a man who was dining alone, we were the only patrons. We selected a table near the balcony and ordered drinks from the bar. While we waited, we checked out the view of Long Street from the balcony. When our server arrived, Judith and I ordered prawns and rice, Sandra the fish. We watched the bartender mix our drinks as we talked among ourselves. The drinks looked refreshing but when my mojito arrived, it was too tangy so I sent it back and asked him to add more sugar. Judith’s strawberry daiquiri, on the other hand, was perfect. It seemed like forever before our meals arrived. We joked that the fish was probably still on the plane from Havana. We were dying for some appetizers but had been so focused on the meal that we hadn’t even thought of ordering any so we nursed our drinks hoped our order would come. Every time we noticed someone coming up the stairs, we felt sure it would be our meal, but it wasn’t. Finally, it arrived but instead of bringing two prawns and a fish, our server brought two fish and a prawn. At first, she insisted the order was correct, then she checked her book and offered a weak apology. The first order had taken so long to arrive, I was tempted to stick with the fish, but it wasn’t what I wanted so I returned it and waited, fingers crossed, for her to bring the other prawn. Sandra took a taste of the fish and rice and made a face. It was so dry, she asked for butter or gravy to soften it. I know if she hadn’t been so hungry, she would have returned it. We definitely considered it but the prospect of going out and finding another restaurant and starting all over was as appealing as her unsatisfying meal. We were sure we had been served leftovers from the day before. And when mine arrived, towards the end of Sandra’s and Judith’s meals, it convinced us we were right. Mine was freshly cooked and very tasty. The prawns soft and succulent, the rice smothered in a light sauce. It tasted delicious and it wasn’t because I was hungry. I felt badly that Sandra’s was so inedible – Judith’s was only a little better. Normally, we’d rave about our meal and share but I didn’t have the heart to talk about mine and even though I offered, Sandra was too upset to try anything else. She just wanted to leave. We complained, of course. The worst part is, no one even offered a dessert or drink to compensate for the lousy meal. After our server brought our bill, I concluded that she must have been having a bad day — and her luck was not about to change. When I checked, I noticed there was no tax included and pointed it out to her. She insisted it had been but I double-checked and it wasn’t. At that point, I wasn’t about to point out her mistake. We paid the check, sans tip from Sandra, and left. As we headed back towards the V&A Waterfront, we noticed people going into Mama Africa. Without even a second thought, we followed. 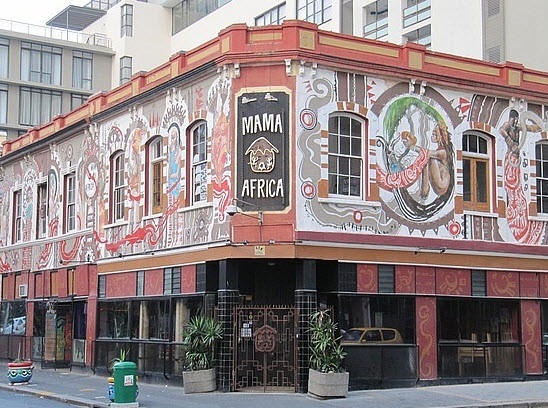 A much bigger restaurant than the one in Victoria Falls but with a different menu and the same African vibe, Mama Africa Cape Town boasts an impressive bar area with an unforgettable painting of a snake wrapped round the edge. Although there were quite a few empty tables, we decided to sit at the bar. We ordered drinks and appetizers while we chatted with the bartenders. When they found out that we were Jamaicans, one of them offered to take us to Mzoli’s but we weren’t up to it. We had an early start the next day. I’m not sure how long we were there before the band, Abavuki, took its place and started warming up. A lively group of between nine and eleven musicians, Abavuki plays African Jazz and African and American soul. Their music was so infectious, it made us want to get up and dance and sing along to the American songs we recognized. 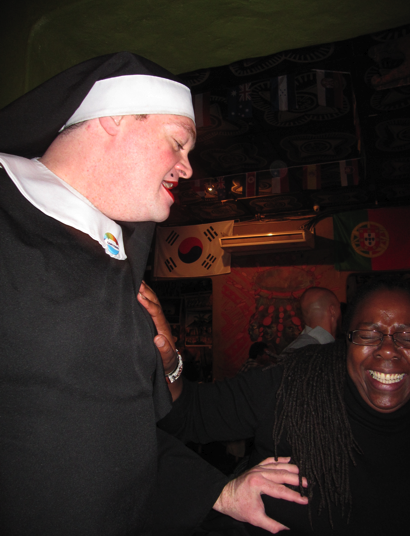 At one point, I noticed a nun – a very tall nun – walk through the door but paid no attention. When I returned, the nun was talking to Sandra and Judith – figures, right? Turns out, this was a nun in drag selling tickets for a concert the following day. 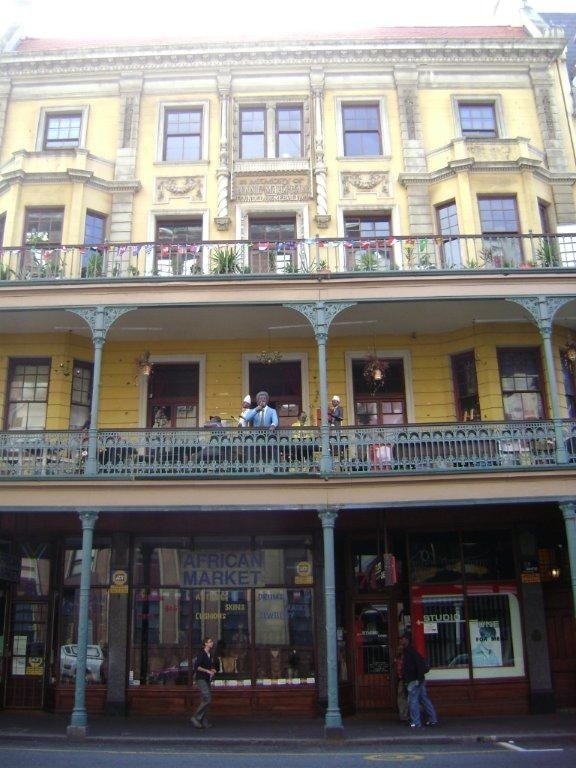 By the time we left Mama Africa, it was near 9:00 or 10:00 p.m. Green Market Square had long closed and Long Street was turning into the hot spot that it becomes on weekends. We called for a cab and headed for home.